Mathematics Research Center Symposium: Theory of Dispersed Multiphase Flow covers the proceedings of an advanced seminar conducted by the Mathematics Research Center of the University of Wisconsin-Madison on May 26-28, 1982. The book focuses on solutions of long chain polymers in liquids, magnetic control of particle suspensions in fluid streams, aerosols, dense granular flows, and ice crystals or vapor bubbles dispersed in river waters. The selection first elaborates on the effects of interactions between particles on the rheology of dispersions; rheology of concentrated macromolecular solutions; and a survey of results in the mathematical theory of fluidization. Discussions focus on Rayleigh-Taylor instabilities, linear instability theory, steady solutions, general theory for polymer solutions and suspensions, electrostatically concentrated suspensions, and pair interaction theories. The text then examines instability in settling of suspensions due to Brownian effects; enhanced sedimentation in vessels having inclined walls; and simple kinetic theory of Brownian diffusion in vapors and aerosols. The text takes a look at the simulation of aerosol dynamics, continuum modeling of two-phase flows, multiphase mixture theory for fluid-particle flows, and mixture theory for turbulent diffusion of heavy particles. Topics include plane gravity flow, decomposition and averaging, isothermal flows of dilute suspensions, kinematics and the equations of motion, diffusional regularization, kinematic waves, and aerosol formation and growth in uniform systems. 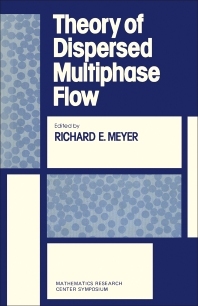 The selection is a valuable source of data for researchers interested in the theory of dispersed multiphase flow.